Steelbird all set to roll out new BIS Standard Helmets : Asia’s largest Helmet manufacturer, Steelbird Hi-Tech India has announced that it has become the very first helmet brand in India to receive certifications and approvals for its products and facilities to meet the new BIS standard for helmets i.e. IS 4151 :2015. Steelbird is the first company in India who is ahead of time and has already upgraded its manufacturing facilities , labs and designs to meet the requirements of new standard which will be in force from 15th January 2019. It has received prerequisite certifications and all the helmets of steelbird are being produced as per the new guidelines. The new Helmet standards IS 4151:2015 will replace the existing IS 4151 :1993. This is a welcoming step in a bid to improve safety levels and curb poor quality helmet sales. 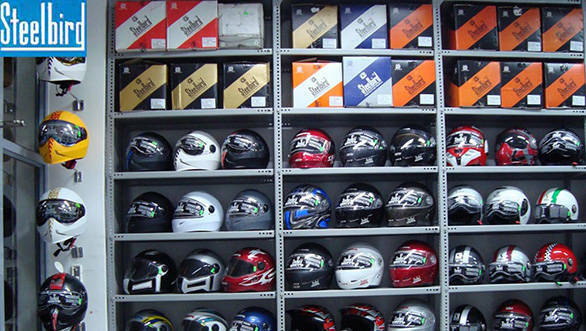 Under the new standards, helmet manufacturers has to take care a lot about four parts of the helmets which are shell, Expanded Polystyrene (EPS), Chin Straps and Visor. The transport ministry has also announced that the sale of non-ISI standard helmets will now be treated as an offense, while the new helmets will be specified as Two Wheelers helmets those meant for motorcyclists, so bikers do not bypass the law by wearing ISI-marked industrial helmets. Furthermore, the new guidelines issued by the transport ministry have revised the rules for testing the new motorcycle helmets. The impact absorption test has been modified with number of additional impact points, use of kerbs stone anvil etc. The tests now include the front impact test under various conditions of temperature and humidity. There will be new tests added to stimulate the abrasion of the helmet during an accident and the effectiveness of the retention system. There will also be an additional micro-slip test and abrasion test for the chin strip added. Another test for the retention system’s quick release mechanism has been added under the new guidelines. This standard specifies requirements for materials, construction, workmanship, finish and performance for protective helmet (with or without lower face cover) for everyday use by two wheeler riders. The helmets covered by this standard are not intended for high-speed competitive events. The standard specifies helmets of the sizes 500 mm, 520 mm, 540 mm, 560 mm, 570 mm, 580 mm, 600 mm and 620 mm. to match the head forms. Commenting on the new development Mr. Rajeev Kapur, MD, Steelbird Helmets told that it was the most challenging task for us to implement this standard as we have more than 60 models of helmets which are made in 3 different sizes each. So at any given point we have 180 helmets which were trialed & tested to get it according the new standards and we are proud that we have succeeded and much ahead of time. “The new two-wheeler helmets under the mandatory certification regime are lighter and airier however going through the strident quality checks. Steelbird has an installed capacity to produce 22,000 Helmets per day and all the helmets will be meeting the new ISI standards. The deadline to implement the new standard is 15 January 2019 and at Steelbird we are ready as of today to launch products which will meet the IS 4151:2015 standard” added Mr Kapur. The new Helmet Standards have been formulated keeping other International Standards in consideration with the sole objective of increasing the usage of Helmet while riding two-wheeler without compromising safety.